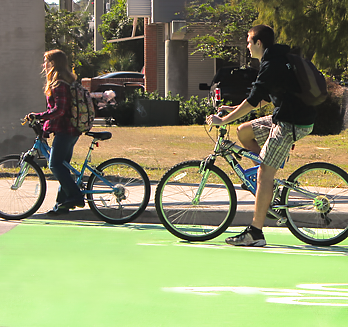 This bicycle network provides over bicycle facilities connecting Downtown, Cascade Park, Florida State University (FSU), Florida Agricultural and Mechanical University (FAMU), and the Stadium Trail. 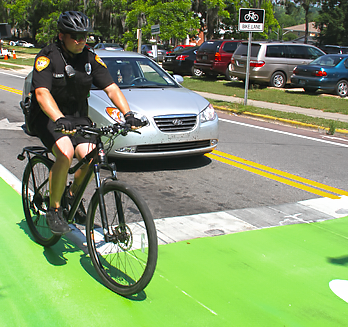 East of Macomb Street - Protected bicycle lanes on Pensacola Street, St. Augustine Road, and Adams Street connect the central Downtown areas to Cascade Park, Civic Center (future Arena District), Florida State University College of Law, and the Cascade Trail among numerous other destinations. 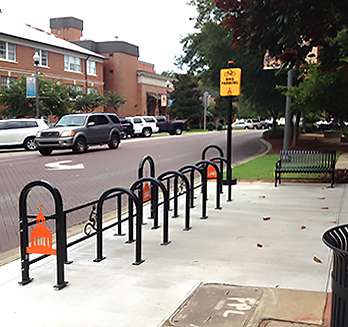 The protected bike lane is supported by existing bike lanes on Macomb Street and Wahnish Way connecting to the FAMU campus. Designated shared lane roadways along Bloxham Street and Martin Luther King Jr. Boulevard provide connections to the All Saints and Frenchtown neighborhoods. West of Macomb Street - Protected bike lanes along Pensacola Street and St. Augustine Street complete the connection from Downtown to the Florida State University and the Gaines Street area. They also connect to the existing Stadium Trail, creating connectivity from Adams Street to Ocala Road. 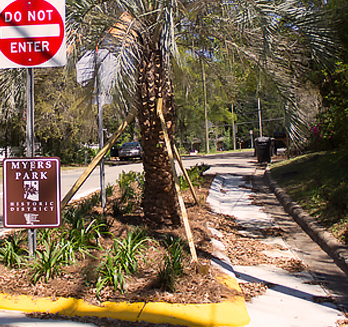 Shared roadways also connect the Gaines Street area to Lake Elberta and the St. Marks Trail at Gamble Street. What are protected bike lanes? - With bicycle use on the rise, communities are realizing the benefits of building protected bike lanes to make getting around by bike easier and safer. Protected bike lanes provide more space and physical separation between the bike lane and vehicle lane compared with traditional striped bike lanes. Buffer zones between vehicle and bicycle lanes. 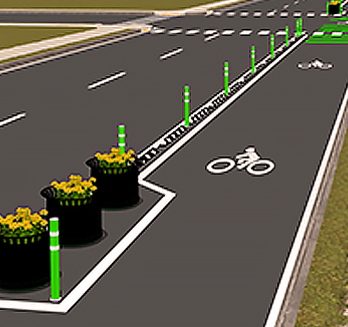 Planters prevent vehicles from entering bike lane. Bicycle boxes, or advance stop bars, provide a highly visible, painted area of the roadway for cyclists to wait at signalized intersections. 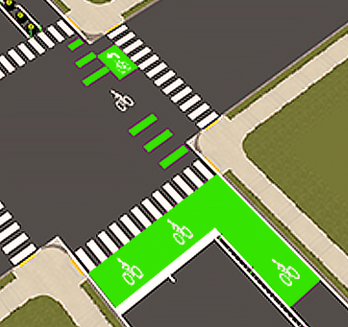 Bike boxes consist of a bright green area with a white bicycle symbol inside the box, located between the white stop bar and the pedestrian crosswalk. At red lights, cyclists stop in the bicycle box ahead of motor vehicle traffic, which must queue behind the bicycle box. 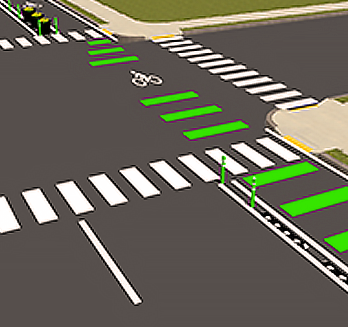 Bicycle boxes reduce right-turn conflicts between cyclists and motor vehicles and improve safety through increased cyclist visibility at intersections. To learn more about bike boxes, please watch the City’s How Do I? video below, or download the brochure. Tallahasseans are using bicycles to get around town and businesses are seeing customers patronizing them by bike. However, many public spaces, popular commercial districts, area parks and local attractions lacked sufficient bike parking to meet demand. 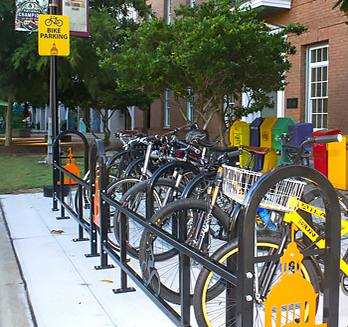 In response to requests to increase bicycle parking, the Tallahassee City Commission approved a bike rack program in 2014 that provides public bike parking along public right-of-ways and in Placemaking districts throughout the MultiModal Transportation District (MMTD). 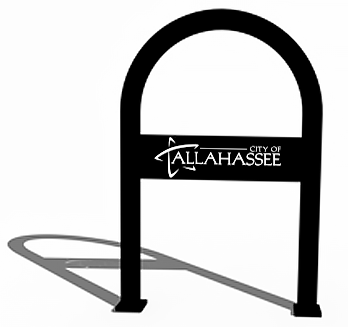 The city's public bike racks are an inverted-U shape featuring the City of Tallahassee logo. Although bike racks will not be installed at private businesses, Planning Department staff is available to assist local business owners who want to install bike racks on their property or design their own unique bike rack or corral. Bike corrals provide parking for a larger number of bikes in a small space and benefit local businesses by providing customers a central place to park their bicycle, freeing up sidewalks and encouraging the growing number of people on bikes to stop and shop. Commercial districts, mixed-use areas, and public spaces are ideal areas for bike corrals. Bicycle parking can be provided efficiently by repurposing existing on-street parking spaces or available public right-of-way. Additional corrals are planned throughout the Multimodal Transportation District, including All Saints, Midtown, Frenchtown, and the Monroe-Adams area. 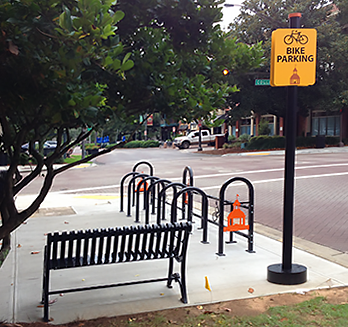 Tallahassee's first bike corral was installed in downtown Tallahassee at the corner of Adams Street and College Avenue. 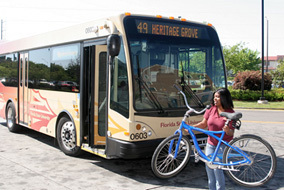 Bring a bike on any StarMetro, Seminole Express, Venom Express or Rhythm Route bus. 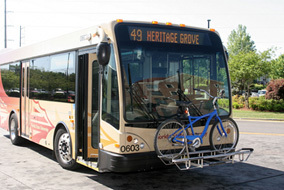 All buses are equipped with a front-loading rack capable of carrying two bikes. 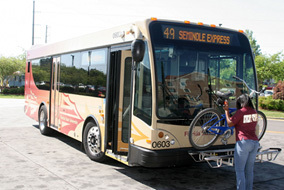 It’s an easy, safe and convenient way to combine a bike ride with a bus trip and venture through Tallahassee. You are responsible for loading and unloading your bicycle. Operators are not permitted to assist. Bicycle racks hold two bikes and available on a first-come, first-served basis. Bicycles are not allowed inside StarMetro vehicles. Bicycles with 16 inch or larger wheel sizes fit easily and securely on the rack. 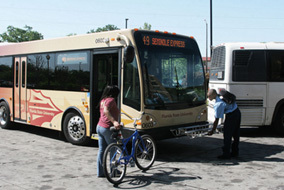 StarMetro is not liable for damage to the bicycle and property attached to the bicycle. No additional fees are required. 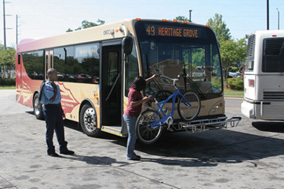 Load your bike onto the bike rack before boarding the bus. Do not lean the bike against the bus. Place bike in back slot if available. Slots labeled for front/back tires. to secure bike in place. 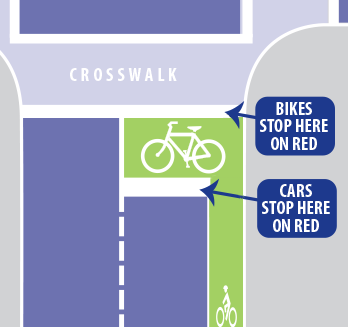 As the bus approaches your stop, inform the operator you will be unloading your bike. This will ensure the operator waits until you and your bike are clear of the bus before leaving the stop. 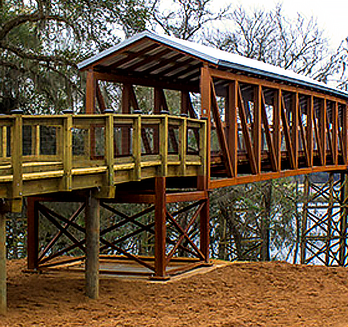 Lafayette Heritage Trail Bridge - A pedestrian bridge over the CSX railroad tracks safely connects the Lafayette Heritage Trail Park and the J.R. Alford Greenway. Oakland Avenue - The traffic chicane at Oakland Avenue and South Gadsden Street restricts westbound vehicle traffic but allows bicycle access. Stadium Trail Improvements at Ocala Road - Ramps at the Stadium Trail and Ocala Road intersection allow cyclists to easily access the trail and merge onto Ocala Road. 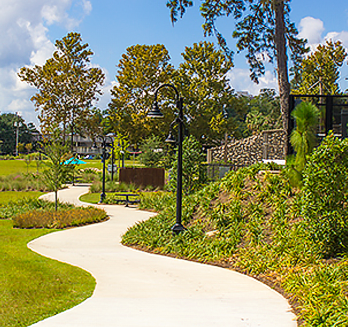 Cascade Park - A state-of-the-art urban park featuring over two miles of multi-use trails and sidewalks, a world-class amphitheater, and other amenities.